Digital marketing is the one and the only tool to achieve fast results and to increase your sales volume in 2018. You may choose to participate in exhibitions, develop referral programs with other agencies, work with the existing client database, and advertise in print and outdoor, hold open house, network with influencers. But when the capabilities of the database are depleted, the time is of the essence, and partners are taking their time with referrals, the only viable option left for getting new clients is digital marketing. We have used our years of experience to develop for our partners a simple yet efficient real estate marketing scheme comprising three tools, which achieve quick results, attract new clients and boost their real estate sales. This scheme is ideal for the sale of the premium real estate, residential and commercial properties including apartments, houses and condominiums for primary and secondary homes. Each property in the real world has its own unique physical address which lets the property be found among hundreds and thousands of similar houses and apartments. We at The Leading Properties of the World create a unique address for your property on the internet so each client can find it using simple search methods. If your target is to market the whole region — no problem. The approach mentioned above for marketing real estate is as much applicable to the marketing of a single property as it is to a whole region or even a country. What is it for? Each year information on the internet grows exponentially. You may easily find any information you may need, and as easily get lost in terabytes of images, videos, and texts. 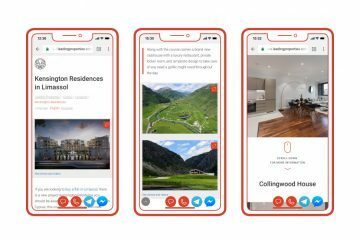 Hundreds of thousands of listings compete for user’s attention on large real estate agencies’ websites, and on international, and local real estate portals. Type into Google “buy flat in new development” and among search results you will find RightMove.co.uk, Zoopla, Prime Location, OnTheMarket, Realtor.com and other online advertisers. So how do you make your offer stand out to a potential client? Individual property marketing exists to answer this question. Each promoted property or region can have a unique address to it. For every real estate listing, we create an individual long-form content page. It features a unique and detailed description, history of the property, a link to a map, specifications, photos, videos, layout plans and any other additional information. Supplemented by unique graphic elements, we have developed a minimalist and informative visual approach used to invoke trust in clients as well as to be perfectly displayed on any screen of any size. A long-form content page can be created within a few days or weeks depending on the materials at hand and versions in other languages. A unique domain name can be linked to a page if requested. According to Internet World Stats by the end of December 2017 the internet had more than 4 billion users and every second user peruses the internet via search engines. The main goal of the long-form content page is to get to the top of search results without utilizing contextual advertising and supplementary marketing. This is achieved by strict compliance with the requirements of search engines and by optimization of each page, including a short URL corresponding to a keyword or a phrase, the appropriate title along with the first paragraphs, as well as addition of the relevant keywords in the text. The average length of a page in Google top results is 1,890 words. A quick analysis of the major real estate agencies such as Sotheby’s International Realty, Christie’s Real Estate, Barnes, Knight Frank, Compass, and online advertisers such as Realtor.com, Lux-Residence.com, PrimeLocation.com shows that providing each listing with an individual page and a high-quality text is not an easy task, especially when there are hundreds and thousands of listings online. On the platform The Leading Properties of the World we use so-called Long-Form Content which usually consists of more than 2000 words for the purpose of search engine optimization. What makes users come back to your web page? Share information on the listing with friends and partners? Re-Post information on their social networks profiles? Request additional information? Adequately perceive re-targeting? Among the most important social triggers is whether your content is engaging, relevant, up-to-date, and complete. Do the page, its content, and design invoke trust? Are familiar and convenient feedback channels are present? And, many others. At The Leading Properties of the World, we utilize all the social triggers listed above when property’s page is created. According to Statista of October 2017, Google’s worldwide search services market share totalled 86.87%. This means that if your potential client is searching for property, then he or she, most likely, is doing that via Google search engine and you should pay particularly close attention to how your pages comply with Google’s performance requirements. There is a noteworthy tool called Google Page Insights which allows analysing any page on compliance with performance requirements. 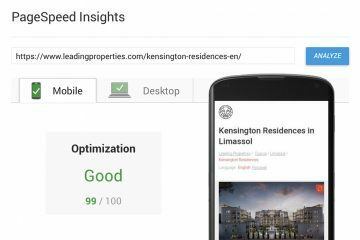 Google also makes use of a special website ranking system based on the optimization score which is calculated in percentages. When ranking performance Google considers numerous factors including the optimization of images, caching, the presence of resource-demanding scripts etc. But the main criteria are the server response time and size of your web page. If your web page loads fast and doesn’t contain any large-size images or videos, Google will score it high. However, if your page lags behind and is overloaded with scripts and other elements, Google will score it low. This score will later influence your website’s position in search results. At The Leading Properties of the World, we have managed to achieve a score of up to 99%. Is 100% possible? Yes, but only on a test server. As soon as you introduce Google analytic scripts the load speed of a website slightly drops dragging the score down to 95—99%. Now go on and compare our results with the results of the major advertisers and real estate agencies’ websites. In 2018 Google launched Mobile-first Index. In short, it means that mobile version of a website will have primary importance for search results purposes. It also means that you are at risk of losing a high percentage of potential clients if your real estate website is not optimized for viewing on mobile devices. Are the large images of yours not loaded in weak signal areas? Did your page “freeze” because of a video or a link to Google maps? Does your navigation bar not display correctly in mobile view? Did your feedback channels stop working because of a phone’s system update? Or can you show a website without a special application? All these issues have been solved at The Leading Properties of the World and each web page is created along with a mobile version which is perfectly displayed on any devices. The Mobile version is required when you send a web page to your client via instant messengers such as WhatsApp, Viber, Facebook Messenger, Telegram, WeChat and other. In case a sent link can’t be correctly opened on a mobile device, you lose one of the most popular marketing channels available as of today. Who usually buys your real estate? Are they your neighbours who would like to expand their living areas, local investors, large institutional funds? Or are they investors from Asia and the Middle East? During the last year, 83% of all investments in London’s commercial real estate was made by foreign investors. 40% of them were investors from China, Hong Kong, and Singapore. You can get the sales statistics for any region that you are interested in at the local property register, ministry of the economy or in a department of economic development. If your major clients are from Germany, make sure to prepare a webpage in German. Are you targeting investors from UAE, Qatar or Saudi Arabia? The web pages in English and Arabic are a step in the right direction. Clients from Russia and post-soviet countries will no doubt prefer to receive information in Russian language and buyers from China in Mandarin. With The Leading Properties of the World, you can easily manage language versions of any web page, create new web pages in any language and launch advertising campaigns in the language you need. According to Statista digital advertising spending is expected to grow from$266 bn in 2018 to $341 bn by 2020. Today internet is the largest great advertising platform. The main income of search engines like Google, Baidu, Yandex, Bing comes from contextual advertising. The income of social networks such as Facebook, LinkedIn, and Instagram is from contextual advertising as well. Creating a new website or placing your property on a famous platform doesn’t guarantee sufficient visibility and subsequent sales. Your property may easily get lost among hundreds of similar offers and your client may never even see it. Thus, the question is not whether to advertise or not, but rather how to create effective advertising campaigns which allow fast and measurable results and enable sales. You may conduct a simple experiment. Type into Google “buy an apartment in (your region)”. Statistics show that search results on the first page enjoy the majority of conversions. Are your properties among them? You can get the exact figures by using the keywords planner service by Google Adwords. 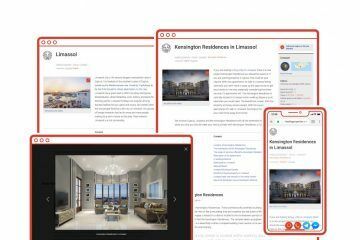 It allows estimating search queries on a specific topic, such as how many monthly search queries there are on new apartments in London, luxury villas in Spain, or in Toscana. Divide this figure by 3 and you will know the approximate number of visitors which should visit your website each month searching for information they need. Does this figure match your visits statistic? With The Leading Properties of the World, you can effectively combine possibilities of organic marketing and contextual advertising in search engines and social networks, get new clients and increase sales. Taking a decision on buying real estate demands time. Buyers collect and analyse information, consider alternatives and then schedule trips and viewings. The final decision is taken after one or several property viewings. The aim of digital marketing and promotion via other media (search engines, social networks, video) is to identify potential customers who are interested in real estate, deliver information about your property to them, get in touch via a phone, a contact form, an email, or an instant messenger and schedule an offline viewing. The success of promotion depends on the relevance of the offer. The more accurate “the match”, the higher the possibility that your advertisement will do its job and reach the client. Of course, there are many factors to consider, such as the language the client speaks, user-friendliness, response time etc. But it is a click that matters. This is the first and easy step for a client to receive necessary information. How easy is it for your client to find the information they need on your website? At The Leading Properties of the World, we utilize targeted advertising. If someone is searching for an apartment in Berlin Mitte, there is no point in offering them apartments in Munich or Frankfurt. If a potential client is interested in the purchase of a villa in Dubai, it is useless to offer villas in Montenegro. For that we already use our separate landing and long-form content pages. A landing page is a separate web page containing information about one or several properties, or a special offer, where users are redirected from the advertisement in search engines, social networks, email newsletters, and messages. 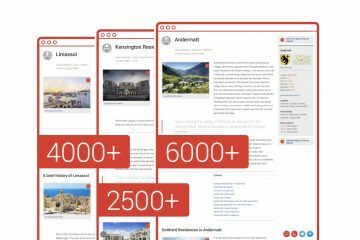 At The Leading Properties of the World, you can create an unlimited number of landing pages for advertising properties. 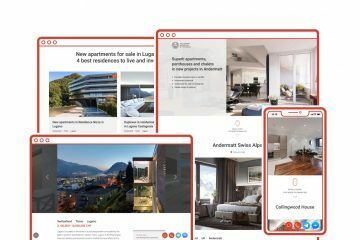 A landing page can be created specifically for a single property, a special offer, or for a selection of several properties, such as TOP-10 apartments in Swiss Alps or TOP-5 villas for rent on French Riviera. Landing pages may contain photos, layout plans, and video content. They are optimized for display on screens of any size and any mobile devices. Each landing page features basic optimization for search engines and is capable of having a unique URL and a title corresponding to a search query. The main advantage of a landing page over long-form content pages is dense format allowing saving time on creation, as well as a possibility to create several landing pages grouped together by advertising or keywords. Each advertisement or keyword will redirect to a separate landing page. For each premium property, an individual digital marketing strategy is created. All advertising campaigns are being tested, enhanced and tunes based on collected data and feedback loop. One of the easiest and most effective solutions is advertising in search engines + re-targeting. The advantage of the search engines such as Google, Yandex, and Bing is that they enable you to specify precise search queries and display your advertisement only when a user specifically searches for something, such as “how to buy a chalet in Switzerland” or “luxury apartments in Miami”. If an advertisement is displayed to anyone, who searches “a chalet in Switzerland” or “apartments in Miami”, you will get a large torrent of clients who are interested in rent and are not going to buy anything. They will visit your page, see no rental offers and promptly leave. The search engines will consider your advertisement non-relevant, raise bids and your advertising budget will increase without any effect in return. Using The Leading Properties of the World, you can avoid such mistakes. Social networks do make possible delivering advertisements to a particular audience grouped by location, age, gender, personal and professional interests. However, you will never know whether they are interested in property purchase or not. Therefore, these tools should be used with caution. If you want to reach clients in Russia, Turkey, and post-soviet countries, Yandex is a step in the right direction. In order to increase exposure, use local services such as Bing. LinkedIn will help you to reach professionals. In order to attract Chinese buyers you will need Baidu as well as placing your information in Chinese on servers physically located in mainland China. 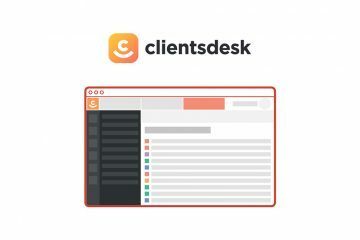 To process incoming requests, and for the sake of quality control, we use a specially developed system called Client’s Desk. Filter our incoming requests, spam, and advertisement, email scams from African and Middle Eastern countries requesting to open a tourist visa and help move money across countries. To measure and control response time and processing of incoming requests. Have visual statistics on all incoming requests, responses, and client workflow dynamics. Setup the automatic response system. Receive receipt and read confirmations for your emails, where a request comes from, use UTM tags to control advertising campaigns. Improve the quality of relationships with your clients; increase conversions and volumes of sales. Client’s Desk is easily fine-tuned for each project, advertising campaign and is not limited by the number of users. 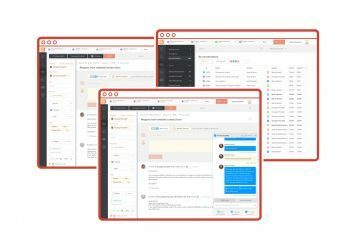 The marketing tools we have told you about suit real estate agencies, sole agents and brokers, developers, property owners, asset managers, and family offices. To launch an advertising campaign you don’t need to change or tweak your existing website or dive deep into digital marketing and marketing strategies. The only thing you need is to set aside a small budget and you will see the first results within the first few weeks. Real estate marketing can be both simple and effective. Contact us to start using the offered tools to sell your real estate. I want to sell a property I own. May I contact you directly? ? Yes, you may. Although our main clients are real estate professionals, banks, family offices, and asset managers we offer our service to some private individuals. No, we specialise in premium property marketing. Our experience can successfully be applied to the sale of yachts, planes, pieces of art or jewellery. We will recommend you the best agencies or brokers in any country or region if necessary. When should I use landing pages or long-form content pages? We give equal preference both to the landing and long-form content pages. They are an ideal combination for organic marketing and contextual advertising. They are beneficial when time is of the essence and possibilities to make full-scale long-form content pages are limited, or when one need to make several pages for all sets of keywords, we recommend launching landing pages only. Our real estate agency has its own website where we advertise our properties. Why should I use your platform? If your current state of affairs completely satisfies you, then you may close this page. However, we will be happy to help you should you decide to significantly increase the effectiveness of your Company’s digital marketing for property sales. Is it possible for a single property to be placed on a separate web page with a unique URL? Yes, we offer such service. All long-form content pages and landing pages can have a unique URL. Can I place my logo? Yes, we can place your logo on your property’s page. How much does it cost? What is the minimal budget? It depends. There is a fixed rate to collect and organize all information, draft advertising campaigns and style and configure marketing pages. However, the main part of our remuneration is received in the event of achieving a successful sale of the clients’ property and closing of a deal. Advertising costs are paid by the client separately. Please send us information about a property you would like to sell or lease and we will calculate the starting budget for the first advertising campaign. Where should I get texts for a long-form content page? We will prepare all the texts in any language for you. How long does it take to get ready and launch an advertising campaign? This can range from one to several weeks depending on the readiness of materials and on the complexity of the advertising campaign.